Math Playground is a great website containing hundreds of mathematics games appropriate for K-8 students. I first reviewed the site back in 2008. Whenever I have returned to it since then, more games and other helpful features have been added to it. Math Playground offers a huge variety of math games for students. You can locate games according to suggested grade level, by topic, or by question type. 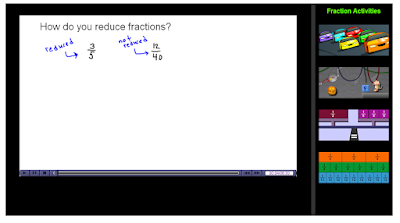 Students who need a refresher on a skill, can probably find one in Math Playground's video library. Math Playground's video library offers more than 100 instructional videos organized according to topic. To the right side of each video students will see some suggested games aligned to the topic covered in the instructional video. Thinking Blocks is one of the most popular features on Math Playground. Thinking Blocks provides interactive templates in which students use brightly colored blocks to model and solve problems. As students work through the problems they are provided with feedback as to whether or not they are using the correct sequence to solve each problem. Thinking Blocks contains templates and problems for addition, multiplication, fractions, and ratios. You can also develop your own problems using the Thinking Blocks modeling tool.